This event will showcase the independent, digital research and classroom work of undergraduate students alongside the innovative assignment design and pedagogical experimentation of faculty and graduate students. 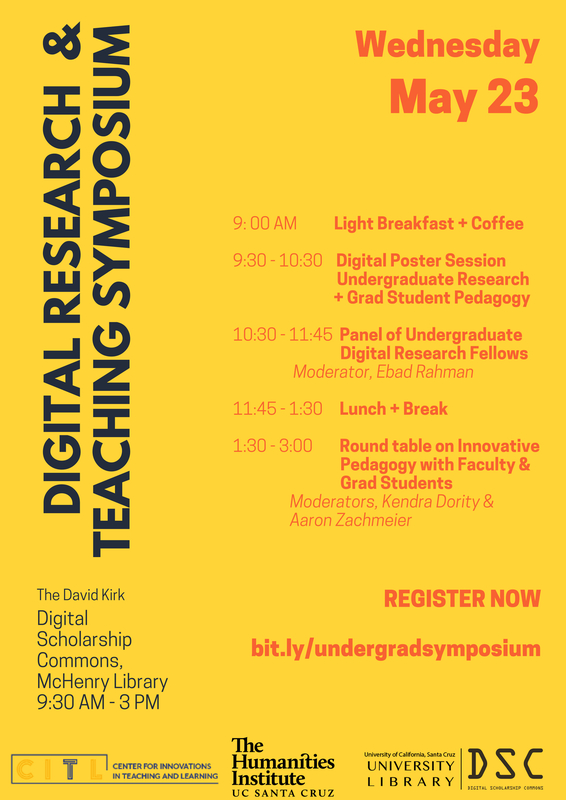 Join us in the morning to focus on undergraduate digital research and in the afternoon for an in-depth discussion about new methods in active and engaged pedagogy. Lunch is included for participants and registered attendees. Co-sponsored by The Humanities Institute, the Center for Innovative Teaching and Learning, and The Digital Scholarship Commons (University Library). Jazmin Lucia Lopez, "Quién es Terana Burke?, y la política de #metoo"
We invite all undergraduate students engaged in creative, critical research using digital tools and platforms to submit proposals for a Digital Poster Session. As part of the larger symposium, the Digital Poster Session provides an opportunity for students to display their work and invite one-on-one conversation without a formal presentation. The Digital Poster Sessions allows students to highlight the interactivity of their work by presenting live digital projects and we encourage you to submit live projects or project prototypes when possible. Classroom work is welcome: you can submit a proposal for individual or group work as long as all authors are represented on the project. We invite all graduate students to submit INNOVATIVE PEDAGOGY PROJECTS or TEACHING ASSIGNMENTS meant to inspire undergraduate learning around digital technologies or public engagement. As part of the larger symposium, the Digital Poster Session provides an opportunity for students to display their work and invite one-on-one conversation without a formal presentation.